The membership from this time contains many old and established Staffordian names and our Past Masters Register reads like a history book of area families. The first was; Worshipful Brother, The Rev. Thomas Browning Mundy on April 11th 1882 and it was consecrated at the Town Hall in Rugeley. Several names appear in the members and officers list which are still recognised locally with many still associated with Freemasonry. Clarke, Buttery, James, Grier, Brown, Gilbert to name but a few. Such was local interest in Freemasonry, no less than three meetings were held in May of that year. In those days the Lodge met every month (nowadays it’s nine meetings only). In the first year more than twenty initiates were admitted to join the lodge. Freemasonry in England is loyal to the monarch and has always celebrated Royal events. On the 16th of March 1897 a proposal was given and accepted that a silver loving cup was purchased to celebrate Queen Victoria’s Jubilee. This cup is still in the possession of St. Augustine’s Lodge which was purchased in June 1897. It was saved for by collective subscription from Lodge members of 2 guineas per meeting ( 1 guinea =£1:1shilling). In today’s currency, about £160.00 per meeting, to buy new today, approximately £1,000.00. It is still proudly used by Lodge members once every year in a special ceremony. In the following years, money was raised for the charitable work and donations at home and around the world. In 1899 a special donation of 2 Guineas was made to the Soldiers and Sailors Families Association (we call it Help for Heroes).The R.A.F. didn’t exist back then. A further 2 Guineas was sent to the South African Masonic relief fund. Illustrating then, as now the, amount of charitable work undertaken by the best of fellowships. By now the Lodge was meeting at the Shrewsbury Arms in Rugeley. Later it had rooms on a semi permanent basis at the old Eaton Lodge on Wolseley Road Traffic Island. When Hostilities broke out in the First World War, St Augustine’s Lodge received a post office telegram, from the then Prince of Wales asking the Lodge for financial support for his “Army fighting fund”. Once more the Lodge of St Augustine’s rose to the challenge. 20 years later, funds were raised to look after wounded soldiers and their families during and after the Second World War and up to the present day along with major donations to Rugeley and District Hospital (sadly no longer there). 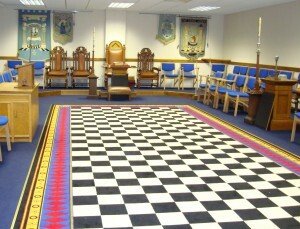 St Augustine’s now meets at The Chase Masonic Centre (Pottal Pool Road) where customised rooms serve many Lodges as well as being where we meet to eat and celebrate our fellowship.